The goal of this science project is to measure hair damage and strength using no hair products and then again after using a variety of different products. You will need a student microscope with at least 100x magnification. When viewing a single strand of hair, the biological elementary student microscope works well. Before you begin, find a few friends or family members willing to participate in your science experiment. It is best to use hair that has not been lightened or darkened, as this alters the strength of the hair. Once you have located your subjects, gather a clean strand of hair from each and place it under the microscope. 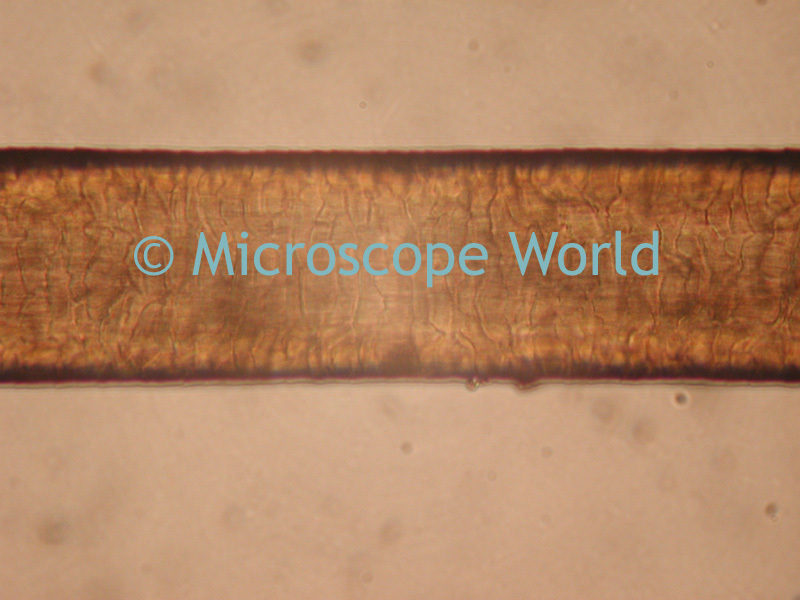 If you can, capture an image of each and label the image with the name, magnification and test # (see example below). After capturing your images, set the pieces of hair aside in a labeled envelope. Later you will want to pull these out again to test the strength of the hair. Once you capture the images, have each friend use the same hair care product for a week. Try something that advertises "hair strengthening" or "heals damaged hair". After a week, collect a piece of hair from each person and look at it under the microscope. Do you notice any difference between the hair from test #1 and test #2? Does the hair care product really make the hair healthier? 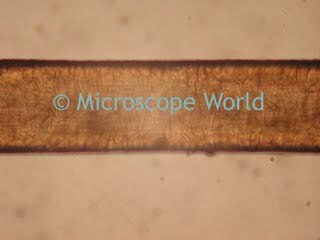 A damaged piece of hair will have rough edges when viewing it through the microscope. You may want to have the subjects try another week of the hair product and compare a third time. Finally, take the hair from each session and try to break it by pulling on each end. Do you notice a difference in the strength of the hair that was not treated with any products to those that were? Did you notice a specific color of hair tended to be stronger than others? If so, you could complete a secondary science project by gathering more samples of similar colors of hair for comparison. If you have great findings from your science project, send us an email, we would love to hear about it!